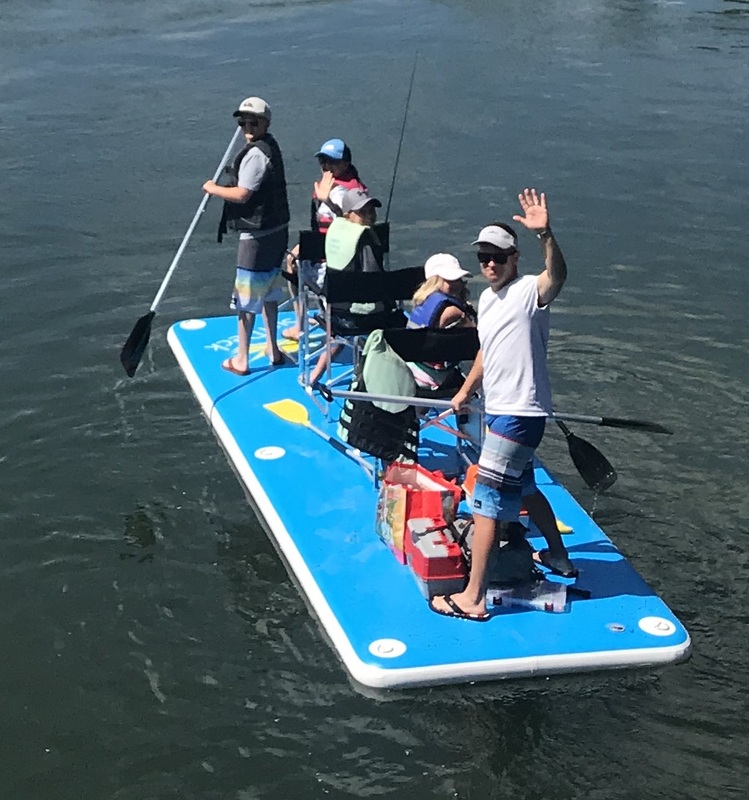 ONLINE BOOKING DISABLED - CALL FOR AVAIBILITY/RESERVATIONS AT OUR 6,000 Sq Ft FACILITY - 541-647-4433 - At 5' by 15' by 6" - this Stand-up Paddle Board has earned it's name as the Sun Deck of all SUPs. 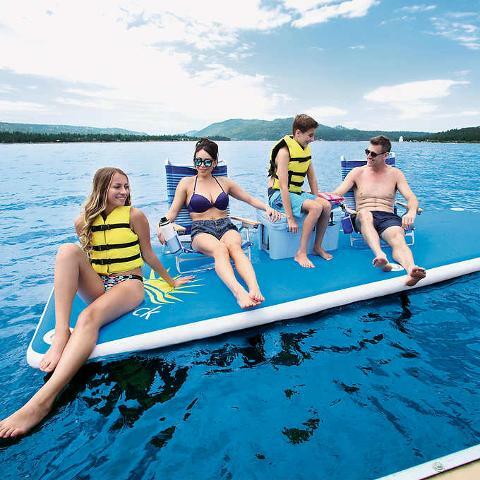 It can easily handle 8 adults and children on the board with an 1,100 pound capacity, or 6 comfortably seated adults with the optional seating added at no charge. Pictured with only 6, it can handle much more. As you go down the river, you will be greeted with stares, waves and shouts as you pass by on this king sized paddle board. two people can easily carry it to the water and our specially designed trailer can transport it completely inflated. Comes with 2-4 SUP paddles, and life vests for all occupants and chairs if requested. 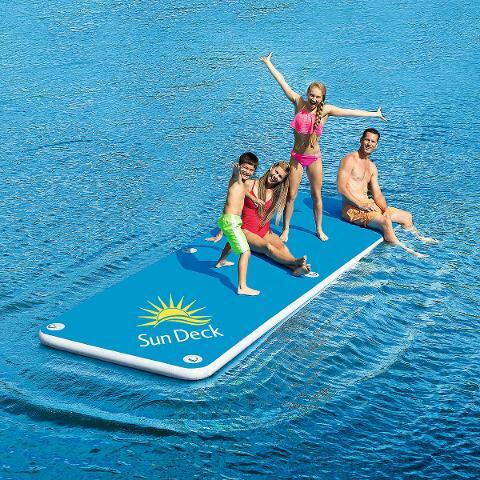 The Sun Deck utilizes state-of-the-art drop-stitch construction and inflates to 12 pounds per square inch for an incredibly solid feel on the water. It is virtually un-tippable (can stand on edge and jump up and down! ), easily maneuvered, has nearly zero wind resistance. Can be easily navigated down river with a single paddler at the bow or paddle upriver with 2 to 6 paddlers. Turns on a dime and with only a few inches of draft can be taken into very shallow water. In summary - It Rocks On The Deschutes!!! Pick up as early as 9am - Return by 5pm same day or 9am the following day. Multi-day rental rates available on request. Want to access the Deschutes River? Have SHARC Recreation Plus Passes or an owner's SROA pass? Please deflate all inflatables and securely tie down hard body items and return them to ToyHouse by 5pm or 9am the following morning. Remember all the vests, paddles squirt guns, etc. Leave one car at the marina and bring the whole tribe to ToyHouse – we'll get everyone vested and shuttle your rental equipment to Harper Bridge (or other selected put-in) for your float/paddle. ToyHouse can not pick up equipment at the SROA Boat Launch. If you can't transport hard bodies equipment, rent inflatables) Harper to the SROA Marina is a really great 1.5 hour paddle (2.5-3 hour float). Come directly to ToyHouse and we load all your equipment for the put-in trip. No SHARC Passes? Only have one car? No tow vehicle? No Worries! - Give us a call and we'll figure out the best plan for your group's desired trip length. Floating Down The Deschutes River? We have self-directed Floats and Paddles varying from 30 minutes, 45 minutes, 2 1/2 hours, 5 hours, 8 hours & longer. Our staff would be happy to discuss your paddle and floating options. Don't forget the camera – we have a free waterproof still/video camera – just buy the 8GB SD card for $20 to take the SD card & free adapter home with you. Taking a Day at The Lake? Elk Lake Resort has music and food service every Saturday Night through the Summer. So you can spend the day at the lake and end your great day with music and dinner overlooking the lake. We have all sorts of water play toys for a fun day at one of the many lakes nearby. There are floating islands, tubes, water toys, kayaks, canoes, SUPs and so much more to make your day at the lake a memorable one. 12V pumps available for on-site inflation of inflatable toys. 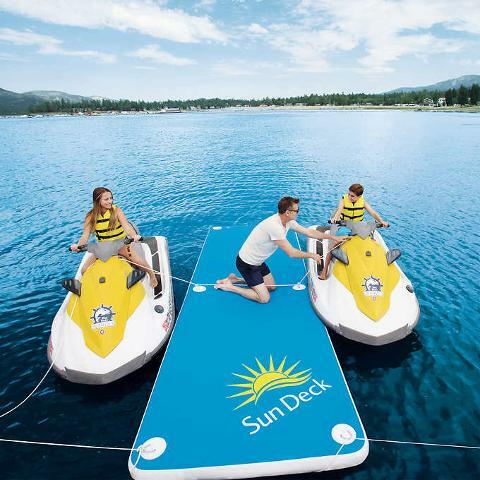 Cultus Lake is just 20 minutes from Sunriver - for great days floating, paddling, kayaks, SUPS and more around the lake - or bring a jet ski with you too! We do this every day - so give us a call and we can figure out what's best for you and your group - from 1 to 100 - we've got you covered!